International law recognizes every person’s right to food and the fundamental right to be free from hunger. The Voluntary Guidelines on the Progressive Realization of the Right to Adequate Food in the Context of National Food Security were adopted unanimously by the governing council of the FAO in 2004, representing the first time that the there was agreement on the meaning of the right amongst states. The Right to Adequate Food is outlined into the International Covenant on Economic, Social and Cultural Rights (ICESCR). Availability: Ability to feed yourself and your family directly from productive lands and other natural resources or from markets and stores. Adequate: You have enough food to satisfy dietary needs throughout your lifecycle. This takes into account needs linked to gender, age, occupation, and culture. To be adequate, food must not contain adverse substances (as outlined or established by international standards agencies). Must include values relates to food preparation and consumption. Economic accessibility: household or personal financial means to attain food for an adequate diet. Physical accessibility: food is available to everywhere, everywhere (rural, urban). Stability: Availability and accessibility must be guaranteed in a stable manner. What if they don´t have the capacity? 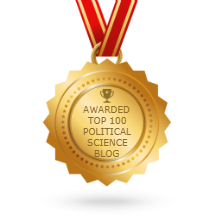 What about when there is disagreement on approaches of how to achieve adequate food (agroecology vs. green revolution, for example)? Introduces redress mechanisms to deal with alleged violations to the Right to Food. Food security exists when all people at all times have access to sufficient, safe, nutritious food to maintain a healthy and active life”. Food Security is a technical and needs based concept and the beneficiaries include vulnerable groups as the object of potential benefits. If we were to achieve the right to food, we would have universal food security, and if we are to achieve food security at the global level then the right to adequate food is being upheld. What remains missing is a focus on food supply and production and here is where a food sovereignty approach can come in. Also, the discourse still remains on the consumer and fails to focus on those who do the work of growing and processing our food. Also, both food security and a right to food approach fail to address what my thesis supervisors Dr. David Barling and Dr. Tim Lang call “the new fundamental”, that is, the key issues we will have to address to ensure food security, i.e., soil degradation, restricted water, shifts in demographics, increased climatic variability, peak oil, population growth among others (check out the explanation of the New Fundamentals on YouTube). There is no real value in developing policies and programmes that do not account for these fundamental challenges to our food systems. 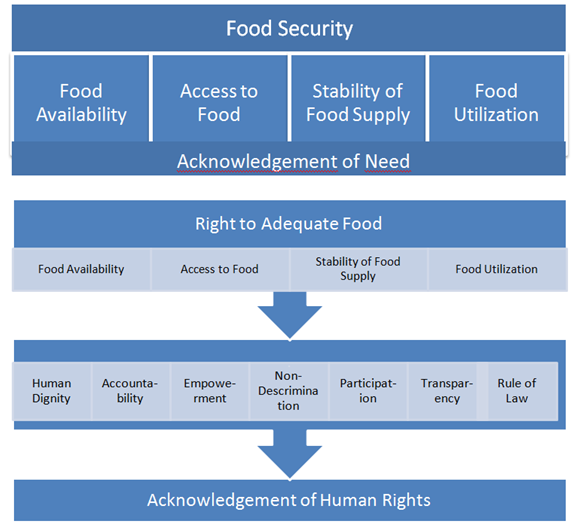 Below are two diagrams, the first outlines a food security approach (with its four pillars based on addressing need) and the second, a Right to Adequate Food. The latter broadens the scope of food security and shifts the objectives from addressing needs to ensuring that the right to food is achieved. The right to food, as a human right, is not negotiable and provides stability for policies and programmes, especially in shifting political climates. From a Right to Food approach then, the beneficiaries of programmes are not the object but instead empowered and engaged partners. I am constantly playing with how to include the new fundamentals, concern for supply and production and distribution as well as the principles of food sovereignty into this model. Oliver De Schutter, the Special Rapporteur on the Right to Food, submitted a report to the Human Rights Council earlier this year which starts to make the links between the right to food and production. I will review the Special Rapporteur and his most recent report in a future post and expand on my desire to see the paper taken further towards a consideration of how to link production, especially agro-ecological production, into a right to food approach. Or vice versa.